Congratulations on the DD, well deserved!! You're very welcome, Why it is amazing! First I saw the idyllic scene en beautiful colors... and than the darkness/ shadow. Wow! 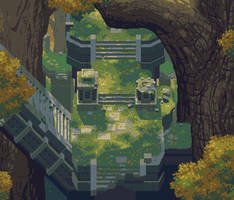 I am usually not so into pixelart, but I find this amazing! Yeah when I make these I try to treat it as a regular painting, then incorporate some of the sharpness and flair from pixel art rather than letting the limitations dictate my style. Real glad you enjoyed it! Hey, that's great to hear! I make a lot of my paintings with phone backgrounds in mind. Congratulations on a well-deserved DD! This is stunning! 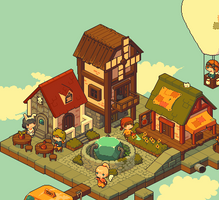 Fantastic concept and composition; incredibly impressive and detailed pixel work! Haha thank you so much!! It makes me so happy to hear that. I felt this way living in a city for several years, so it comes from the heart. Oh, I can completely understand that... living in a large city was very hard on me too. You interpreted your feelings of that time into something really beautiful. Really great work! Thank you for sharing! Thanks a lot!  Stay tuned for more!